There’s often a flippant attitude among members of the public to blaming those who are killed while cycling for their own deaths, usually with nothing solid to back up the link. But if you’re a commentator with access to the media and you want to even hint at victim blaming, you need proof. Journalist Tanya Sweeney does not seem to agree. 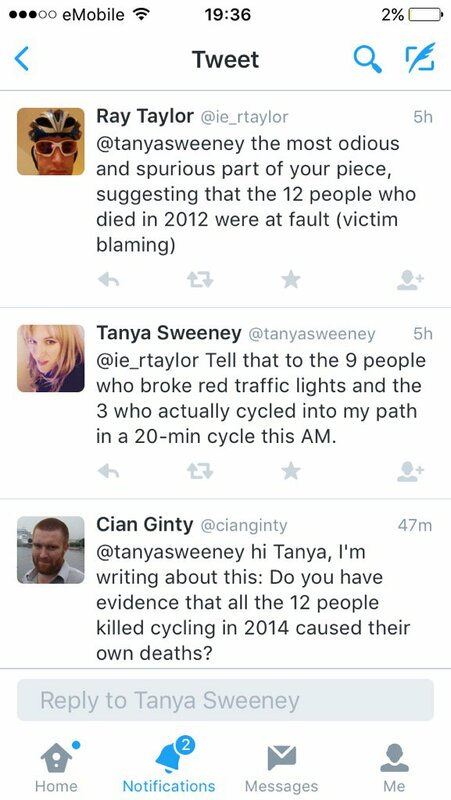 Last week she was happy to link the deaths of 12 people last year to misbehaviour of unrelated people she meets cycling on the streets of Dublin. To be fair to her, she’s not the only one at it but her example is the latest and is fairly blunt. How lovely would it be to bring that number to zero? It would be fantastic. But we’re not going to get there by blaming victims. We need an evidence based-approached. The vast bulk of the deaths she refers to were nowhere near traffic lights. Even if people cycling breaking red light is annoying (and we think it should be stopped), it’s not linked to a notable amount of deaths. The scourge of the city? Not murders, not rapists, and not drug dealers. Or, road users, not those speeding in cars or trucks, not those who park on footpaths and stop on crossings blocking prams and wheelchairs, or not those who overtake people on bicycles within inches just to get to the next junction a few seconds quicker. No. The deadly cyclist. For the record: We agree with obeying the law for all and the on-the-spot fines for people who don’t while cycling. These fines are not for new offences as Sweeney contends and there is so-far a marked increase in the amount of people on bicycles getting fined. Far higher than for a similar amount of time for the older system of court fines. Bizarrely she adds: “It’s curious because, in general, Irish people tend to fall in line whenever a rule is created”… This is unbelievable in the context of RSA free speed surveys showing that 80-90% of motorists break the speed limit on many urban roads; motorists parking on footpaths and cycle lanes the norm around Ireland, and the Gardai and TII highlighting how many motorists break red lights at junctions which Luas trams cross. Lately in the news it was also highlighted that drink driving has not gone away, and that a large amount of people are driving while disqualified. So, it’s very curious how people get to the opinion that people on bicycles break the law disproportionately. Isn’t it? Maybe there’s something wrong with their research? I think a distinct absence of research might me the root of it. Tackle the REAL problems, not the easy targets! I regularly hear of the scourge of cyclists breaking the rules. Yes, many people on bikes do go through red lights. And yet what’s the risk analysis when compared to motorists breaking the rules? They are orders of magnitude apart. Mass x velocity = momentum. A 1-tonne car going at 30km/hr has much more momentum (8333 kg m/s) than 80kg on a bike at 20km/hr (444 kg m/s). Or to put it another way; a 1-tonne car would have to be going under 2km/hr to have the same momentum as 80kg on a bike going 20kph. Nobody in a car is going under 2 km/hr and most are going well above 30 km/hr. And 1-tonne is for the smaller cars, not those large people carriers or land-rovers and what-have-you. And what about breaking the rules? Everyday I regularly (and by regularly, I mean all the time) see cars going over the speed-limit, going through red lights (at speed! ), dangerous over-taking, texting on the phone, talking on the phone, staring at the phone, parking on cycle lanes, parking on the path, not indicating when turning, sat-navs blocking the view out the front windscreen, headlights not working, headlights far too bright, rear lights not working, driving aggressively, and so on. And just to cut to the bottom line: road deaths and injuries are due to what? Not people going through lights on bikes – they’re due to vehicles. Well stated Citizen Wolfe. Cyclist.ie is calling for a rebalancing of monetary fines to reflect the kinetic energy of vehicles in relation to the harm potential at impact with vulnerable road users. And to use also the EuroNCAP rating of the vehicle to compute the fine quantum. The purpose of The Rules of The Road also needs a fundamental review. We say this is part of the paradigm-shift in how we manage traffic from now on. It is why 30 km/h speed limits are so important in residential areas and estates.